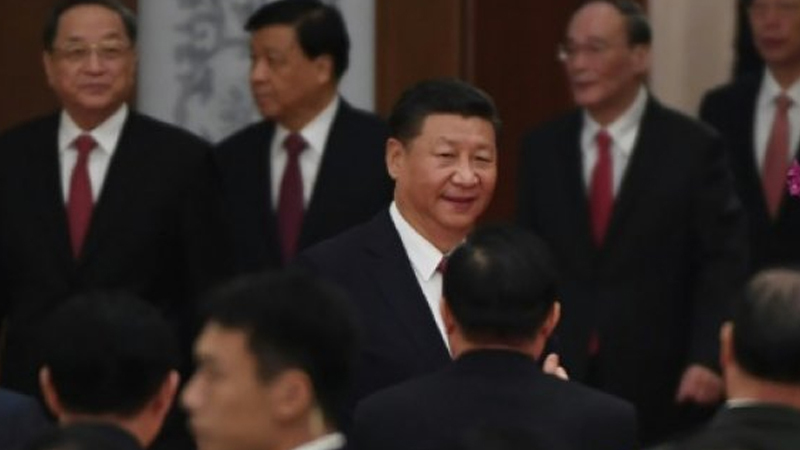 The Central Committee of China's Communist Party said it had passed an amendment to its constitution at the end of a plenary meeting held in advance of the main twice-a-decade congress, which is expected to see Xi Jinping tighten his grip on power. BEIJING - China's Communist Party announced Saturday that it agreed to amend its constitution, ahead of a keenly-watched congress, with speculation mounting that leader Xi Jinping's name will be added to the document, enshrining his legacy. The Central Committee said it had passed an amendment to the party's constitution at the end of a plenary meeting held in advance of the main twice-a-decade congress, which opens Wednesday and is expected to see Xi tighten his grip on power. "The document will be submitted to the upcoming 19th CPC National Congress for review," it said in a statement released through the official state news agency, without giving further details. The congress is expected to see Xi granted the customary second five-year term as general secretary of the Communist Party, thereby renewing his de facto mandate to serve as president of the world's second-largest economy. The official Xinhua news agency said last month that the constitution will be amended during the congress to "reflect the new governance concepts, thoughts and strategies" developed by the Central Committee since the last meeting five years ago. Analysts speculate that Xi's name could be added to the party's constitution, elevating him into the exclusive pantheon of Chinese leaders. That privilege has only been granted to Xi's two most powerful predecessors, Mao Zedong and Deng Xiaoping. The Communist commandments currently features "Mao Zedong Thought" and "Deng Xiaoping Theory", with the political philosophies or ideas of other leaders included without their names. This weeks congress is hotly anticipated to herald a significant shake-up in the leadership ranks, with five out of seven members of the Politburo Standing Committee that rules over China set to be replaced. Saturday's statement from the Central Committee also endorsed the expulsion of Sun Zhengcai, the former Chongqing city head once considered a possible successor to Xi. He was kicked out of the party in September after being ensnared in a wide ranging anti-corruption drive by Chinese leader that has toppled party officials, including potential rivals. China's Communist Party announced Saturday that it agreed to amend its constitution, ahead of a keenly-watched congress, with speculation mounting that leader Xi Jinping's name will be added to the document, enshrining his legacy.